I attended the Mayoral Debate this morning hosted by Radio New Zealand. 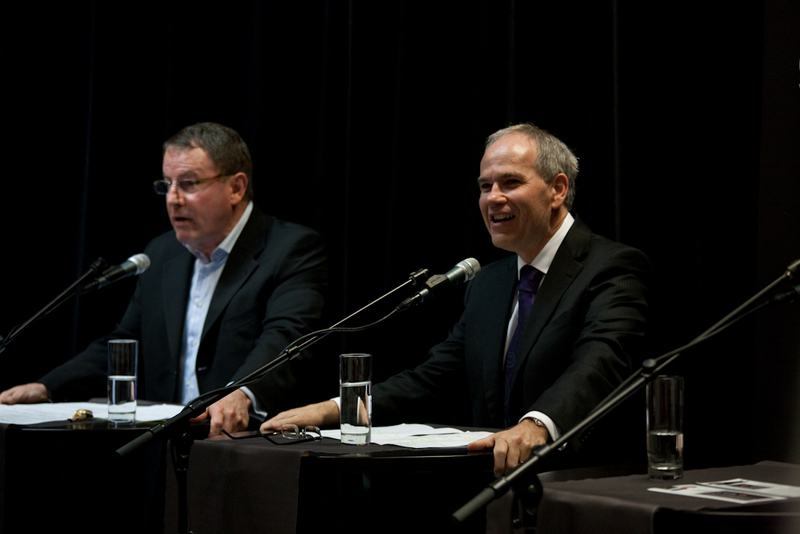 Present were the three leading candididates, Len Brown, John Banks and Andrew Williams. Before the debate started the body language was fascinating. Len and Banksie shook hands warmly. The chill between Banks and Williams was evident. Len spoke about his transport plans. They included rail to the Airport, completing the rail network look by construction of the Queen Street tunnel, a possible road tunnel to the North Shore although he acknowledged that the Anzac Bridge project had some promise. When asked for a timeframe he said 5 to 7 years for the Queen Street tunnel. Banks was asked a similar question. He talked about the need for world class infrastructure and how he supported passenger transport but did not come up with any dates. Len Brown became passionate when he talked about the neglect that Otahuhu has suffered from the Auckland City Council. Despite 30 years of inaction and despite the promise of a swimming pool Otahuhu had been ignored. He also commented that the money that could have been spent on the pool had been spent instead on putting sand on Judges Bay. Banks countered by saying that South Aucklanders used Judges Bay as well! This could be the Melissa Lee moment of the campaign. It spoke volumes of his mindset. “The good people” live in places like Remuera. “Other” people such as those from South Auckland could also use Judges Bay. I cannot imagine anything that would be more enraging to the good people of South Auckland. Rating was discussed. Banks made a comment about the “wild promises of my opponents” which brought the wonderful response by Williams noting that Banks “was promising to bring the Olympics to Auckland”. Banks also read a supposed verbatim comment made by Len at a previous meeting that Banks was not at where it was alleged that Len had advocated for income tax to replace rates. Len replied that Banks should have been there. He also made it clear that he was advocating for a full review of funding for Local Government and that to do it properly all options should be on the table. It is clear from his comments that his primary interest was fairness, particularly for the poor. I am not so sure that Banks sees this issue in the same terms. Len was on top of his game. He was quick with responses, very effective with his jibes and was very funny. Banks in contrast was wooden and although he delivered his selection of quotes well, he floundered when dealing with a debate of the issues.